It is a method of canalization of the Light of God, through the palm of the hand. Johrei has the power to burn stains of the spirit and to dissolve toxins of the body. When accomplishing that process, Johrei dissipates the cause of the illnesses, one of the largest reasons of the human sufferings. Simultaneously it eliminates the poverty and the conflicts. Then that, although the purpose of Johrei seems to be just the cure of the diseases, in a feeling wider, it is a way to create happiness, because it elevates the level of the thought, turned it nobler, purer. The person is going to turn off the negative part and it starts to promote all the humanity’s good, once it makes to grow inside the heart a spontaneous feeling of purity and desire of helping the fellow creature. With that, the depression state is going disappearing and the happiness begins to dominate the daily life. At the same time, the spirit is involved by a deep feeling of gratitude to God for the peace and happiness that it is having. From that level, the person starts to feel the presence of God constantly to involve it, guiding it in all your actions. In that state, it is fully happy and the person understands that, receiving Johrei, it is being placed in constant opposition the any attitude or sensation of depressive. To receive JOHREI it is necessary to change for the Messianic Doctrine? Nothing impedes the greeting of the Light of God. Any religious limitation that enslaves or brings unnecessary sufferings it disables the man of noticing the incommensurable love of God. Then the reason of the members and visitors enjoy full freedom to acquire a pure and spontaneous faith, without cables or impositions. Everything that oppresses the conscience cannot be considered as truth. Which are the reactions when JOHREI is received? As the essence of Johrei is the spirit of the fire, one of the most common reactions is the sensation of heat, arriving, sometimes, to the perspiration. Although being invisible light, Johrei also reaches the physical part, due to the intensity with that is emanated. Like this, then, when receiving Johrei, anybody is alleviated, lighter, tends until the impression that the feelings were enlarged, the heart fills with a state of a lot of happiness. Also of the physical point of view, the elimination of the sludges happens through the perspiration, of catarrhs, coryza, coughs, diarrheas, influenzas, besides other forms. It is common yawns happen during the time in that Johrei is received. It means an immediate reaction of the spirit already eliminating stains burned for the Light of God. 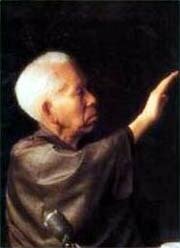 It consists of receiving the Light of God through the picture of Meishu Sama’s hand supplying Johrei in the monitor of the computer. Be in front of it in silence, meditating or reading the Teachings. After some minutes, you will begin feeling better and alleviated. Sometimes yawns happen and the pains disappear. All those occurrences are signs of Meishu Sama’s presence acting through this picture. I thank the permission of receiving the sublime gift of Johrei through Your hand. You purify me of my sludges and wake up me for the truth and the practice of the good. You help me to solve my problems so that I can feel the happiness of living in agreement with the will of God. That picture was taken by a French journalist, the editor boss of the magazine Paris Mach that interviewed Meishu Sama in Japan. After having received from Meishu Sama’s explanations about the doctrine, Johrei and the humanity’s salvation, the editor requested permission to photograph Meishu Sama’s hand supplying Johrei. The editor wanted, later, to publish it in an edition of the magazine with the title the Hand that cures the humanity’s suffering. Immediately Meishu Sama lifted the hand and the picture was made. Unpublished fact, once any member there was adventurous the fellow creature feat, due to the respect that the members devoted him. When the master supplied Johrei, usually all stayed with the lowered head. Although some exist pictures removed in the lateral, this is the only of front. Interesting also to know that, some years later, people of the Church sought the picture and they knew about the journalist’s death. They found, however, the negative with the wife that lived in Switzerland. Understanding the reason of such mysterious coincidences, Lux Oriens Editora found for well to place the photo in the book cover the Art of Johrei. Since then Meishu Sama’s hand supplying Johrei began to appear in several newspapers and magazines. 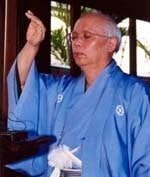 Before such facts and also knowing that the whole love feeling and the will of helping continue in the spiritual plan, we understood that Meishu Sama’s will of channeling Johrei and, for middle of that act, to promote the humanity’s salvation even he living in the divine world. At that plan, there is no limitation of time, nor of space, can the light be channeled eternally. Different, therefore, of the Earth where the activity of Johrei is just restricted to certain periods. Then, when, there is more than two years, some members began to place the picture of Meishu Sama’s hand supplying Johrei in the room, in the bedroom or in the office, they started to receive goodwill. Some another have been accessing in the site of the publisher (www.lux-oriens.com.br), JOHREI ON LINE and, through it, they receive goodwill, solving problems besides of purification. We have been receiving, many e-mails of several parts of Brazil and of the world with cure testimonies, relief and resolution of problems. It is, therefore, very evident that Meishu Sama’s Johrei, through the picture, reaches a little more bottom the spiritual body, making to happen some change inside each person that receives it. It is not an imagination, but of a verified reality: starting from June 15 of every year the purification is going turning more accelerated in consequence of the intensification of the Light of so much God in the spiritual plan, as in the material. It doesn’t just happen the alleviate of the pains and fever, but the more toxins deeply begin to be reached and eliminated. Some people besides are claiming that before slept calm, however, after they placed Meishu Sama’s hand in the room, they started to have headache, clear sign that the toxins are being dissolved more taken root inside the organism, mainly in the head. With that, they will have great improvement of health. Although, at the beginning, suffer some pain, later they will feel very well with the clearest head and alleviated. I also placed the picture of Meishu Sama’s hand in my room. Since then, I began to notice something that before didn’t happen. In the morning, when getting up, I eliminate a red color catarrh. Actually, it is treated of a toxin that is being dissolved in the part of behind of my head, in the area of the nape where they were accumulated. All result of medicines taken in the childhood and of an accident that I suffered having been that area reached more directly. As those toxins go being eliminated, I began to feel more energy, more happiness of living and the lightest head than formerly. It is interesting to verify all we were still weighed, after we were alleviated ourselves, after the elimination of some toxins and spiritual stains. Before nobody notice anything, finding everything very natural. Even not sleeping calm, getting nightmares, being half disturbed, with vertigo after a work period, none sees us in that something of abnormal. All those symptoms, however, it comes from toxins that we accumulated in the organism in consequence of the spiritual sludges. 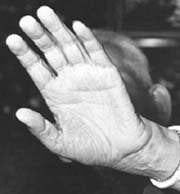 Then when we entered in contact with Meishu Sama’s hand supplying Johrei, it is normal that feel great difference in our general state, because that picture is not simply visible matter. Actually, it constitutes a window through where the rays of the Light of God penetrate. Besides, for Meishu Sama’s fact to be living in the divine world has the power to multiply and, like this, to supply Johrei the all of us. Even being an invisible act, we can establish a narrow relationship with Meishu Sama and the divine world, through of that bridge represented by the picture. Then the importance of we maintain with us that connection link with Him.